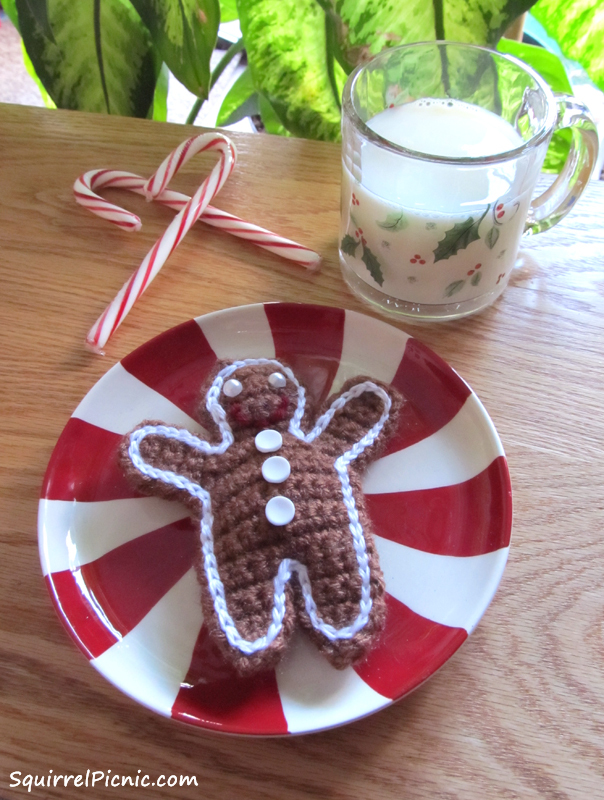 I love baking Christmas cookies, but I think I love crocheting them even more. 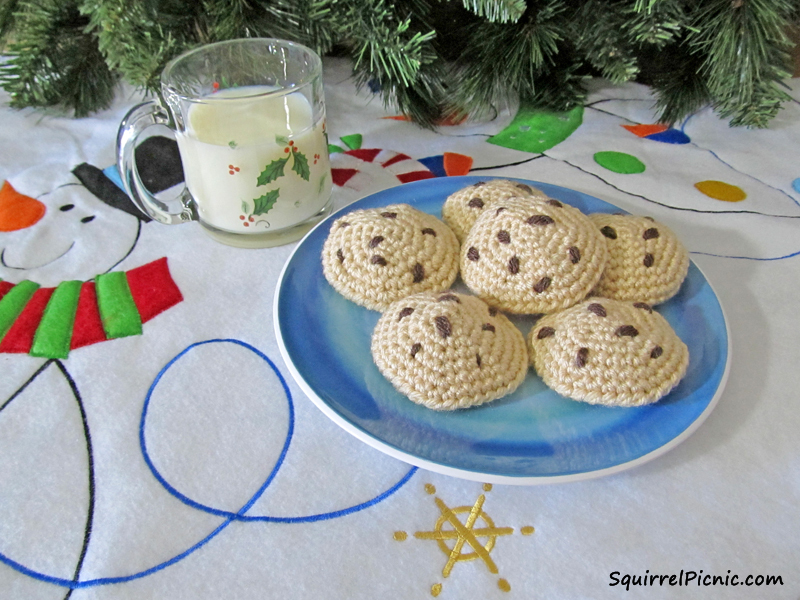 With my Christmas cookie patterns you can crochet a whole platter of cookies! Put some out for Santa or hang them on your Christmas tree. Use them as present toppers to add a memorable touch to your gifts. Or make a batch for the kids to play with. I hope you enjoy all of these fun Christmas cookie recipes… er, patterns. 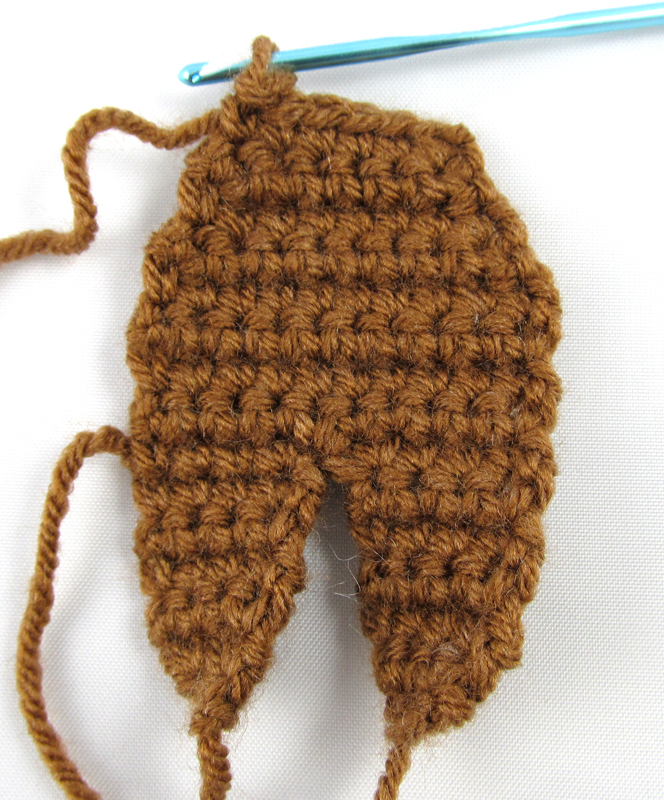 Categories: Crochet It | Tags: Christmas, Christmas story, cookies, crochet, gingerbread, pizzelle | Permalink. Who Would Bring Crochet Cookies to a Company Cookie Exchange? I had a great time at the annual cookie exchange with my coworkers. I was so excited that they loved my cookies. It means a lot when your hard work is appreciated. And, oh, all the glorious cookies! I’m blessed to work with such talented bakers. That brings the Great Cookie Countdown to a close (until next year). 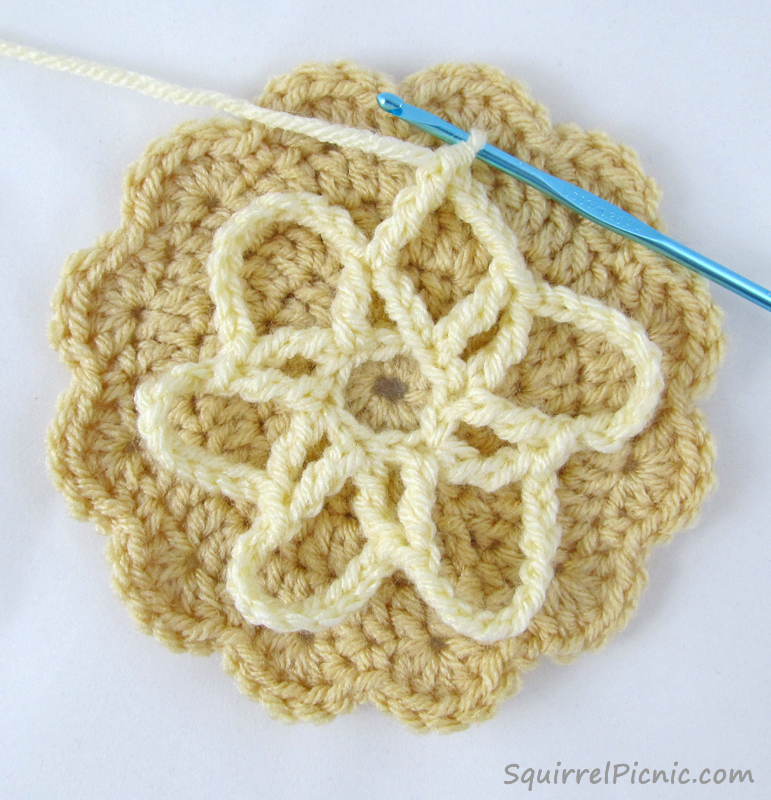 Thanks to everyone for checking out my cookie patterns, crocheting cookies of your own, and sharing the patterns and even cookies with your friends. You all are the best. 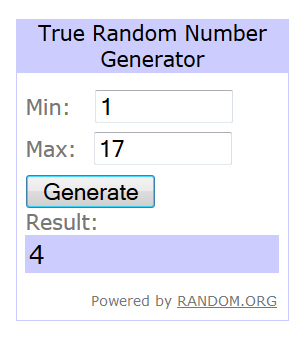 Let’s begin the cookie exchange! Crochet Cookies and Peanut Butter Blossoms. Awesome! 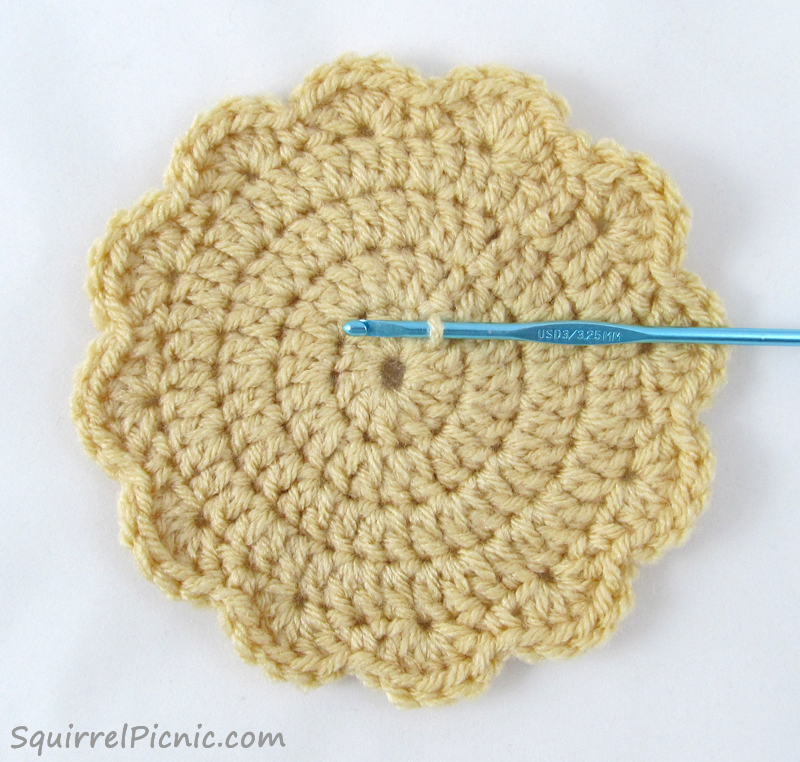 She chose a crochet pizzelle. Yay! She chose a gingerbread man! Yay! All my crochet cookies found new homes! 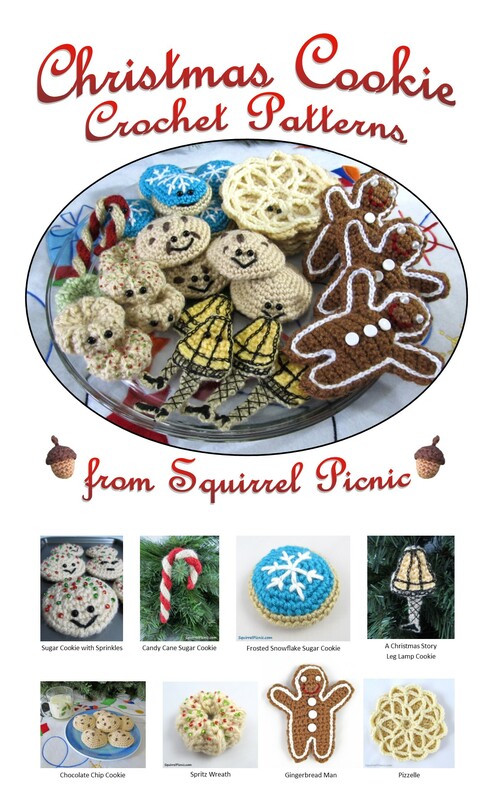 Categories: Crochet It | Tags: baking, Christmas, Christmas cookie exchange, cookies, crafts, crochet, diy | Permalink. Many people would go so far as to argue that the chocolate chip cookie is Santa Claus’s favorite. One little girl I met recently insisted that you have to put chocolate chip cookies out before you go to bed on Christmas Eve, or Santa will just turn right around and go back up the chimney without leaving you a single present. So in case you find yourself cookie-less on Christmas Eve, you better whip up a batch of these chocolate chip cookies. Even if he can’t eat them, maybe Santa will be impressed by your ingenuity and creative spirit and leave that present you’ve got your heart set on. With this final cookie pattern, I am ready to bring a platter of my crochet Christmas cookies to the company cookie exchange today. I can’t wait to see all their faces! I hope they like them. I’ll bring my camera and take lots of pictures to share with you later this week. See you then! Visit the Great Cookie Countdown Page for the story behind this series and a complete directory of Christmas cookie ornaments. 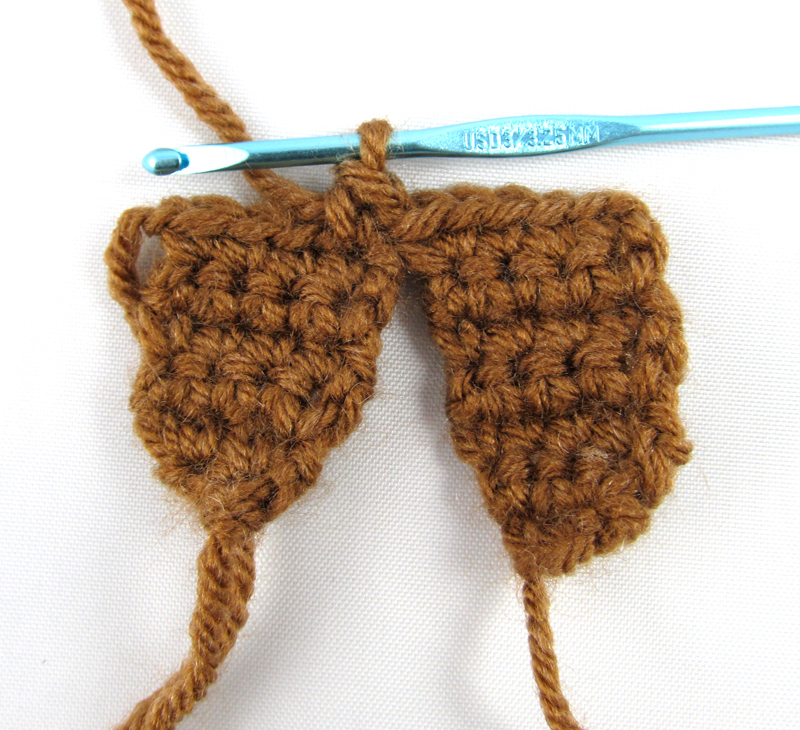 Categories: Crochet It | Tags: baking, Chocolate Chip Cookie, chocolate chip cookies, Christmas, Christmas cookies, cookies, crafts, crochet, diy, holidays, Santa Claus | Permalink. Have you seen some of the frosted sugar cookies out there this year? So many of them are works of art! If someone offered me cookies as elaborately decorated as these by the folks at Martha Stewart, I’m afraid I might refuse to bite into them lest I spoil their beauty. I’ve not been so successful with frosted cookies in the past for two reasons: (1) I like to eat cookies more than I like decorating them and (2) I’m really good at making messes. I greatly admire all those bakers who can restrain themselves from eating their fabulous creations long enough to then frost and glaze and ice them with beautiful decorations. I’m just not one of them. Even if I get to the decorating stage of baking, I’m so messy that I feel proud if I can get more frosting on a cookie than on my fingers. 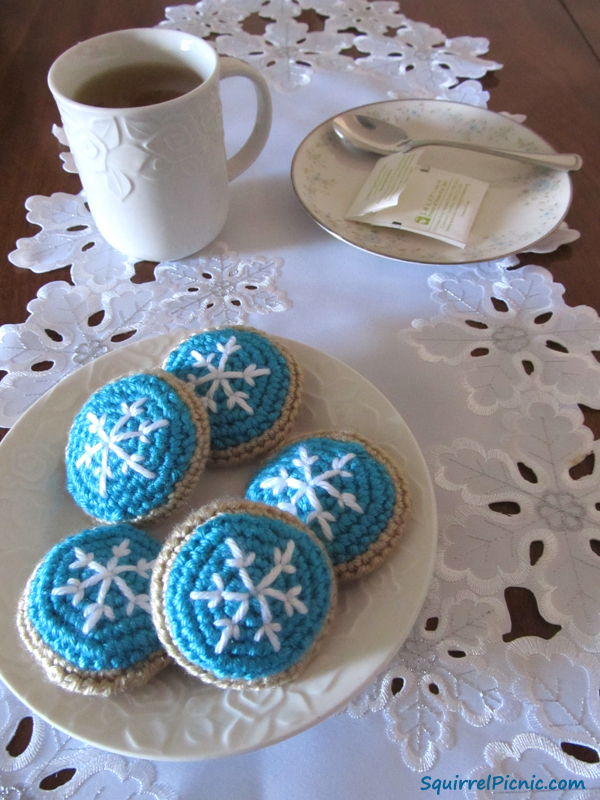 Lucky for me, these crochet frosted snowflake cookies aren’t messy at all! And there’s no reason to be intimidated by that embroidered snowflake design. 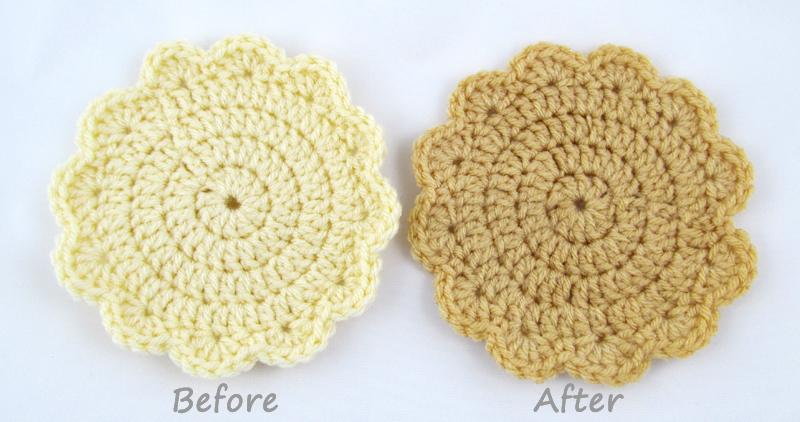 It’s a piece of cake to do, and I’ve included a step-by-step tutorial to make it even easier. 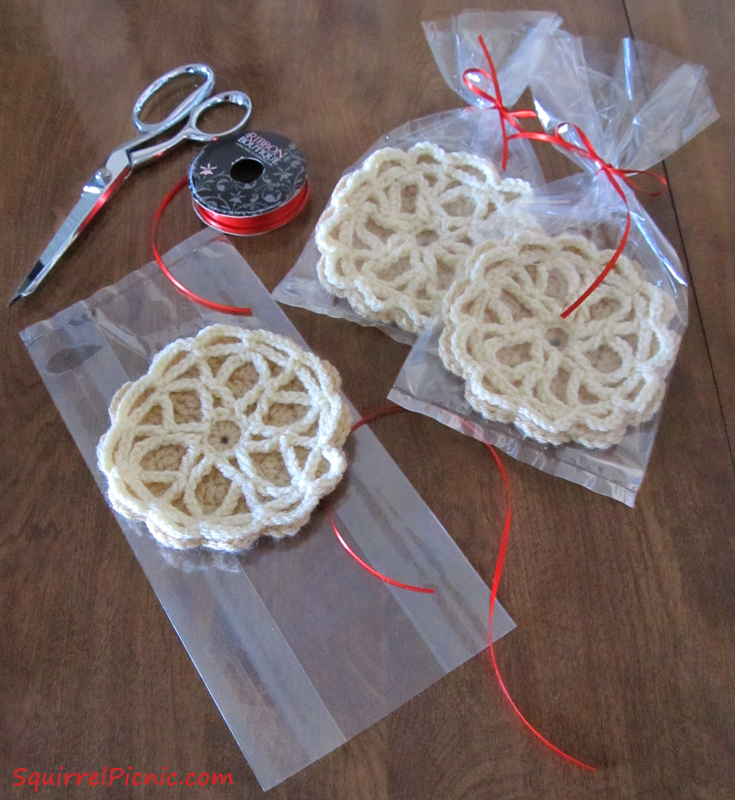 Categories: Crochet It | Tags: baking, Christmas, cookies, crochet, frosting, holidays, snowflake, sugar cookie, toys | Permalink. When I was in high school, I had a friend whose family was of Italian origin. About this time every year, she and her mother would make pizzelle (pronounced like pizza –a +elle). It was almost as fun watching them being made as it was eating them! Although I don’t bake them myself, I have always been intrigued by these delicate cookies. Pizzelle are a waffle cookie made with butter, flour, sugar, and eggs and flavored with either vanilla, anise, or lemon. The batter is poured into a pizzelle iron (like a waffle iron), which would then be placed on a hot stove — although nowadays most pizzelle irons are electric. The iron stamps a pattern into the dough as it cooks. When I was looking for Christmas cookies to re-create, this was one of the first ones to come to mind. 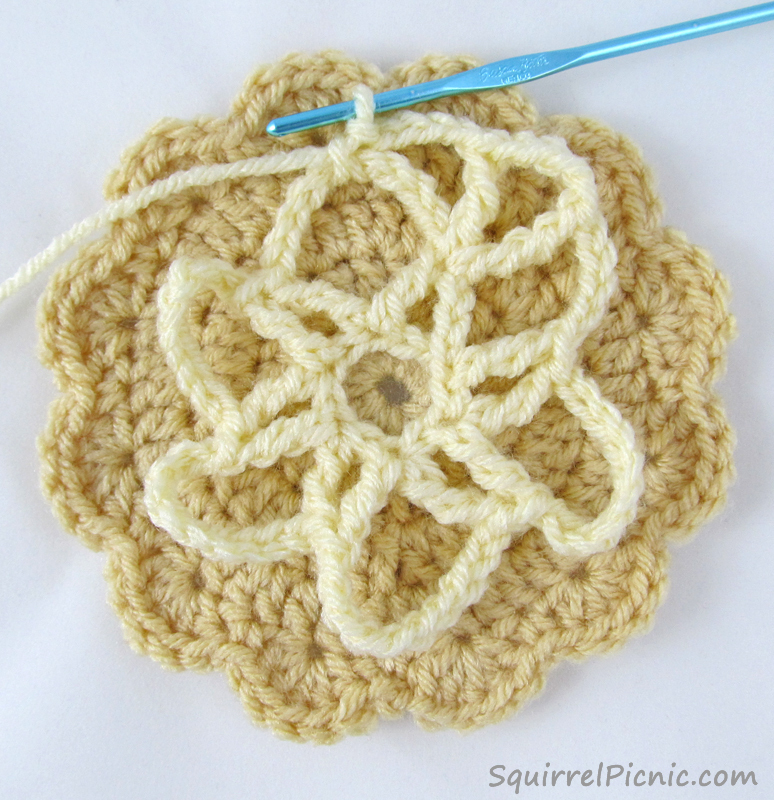 That snowflake pattern was just dying to be done up in yarn. The pattern is worked in two layers to create the depth needed to make the design pop. 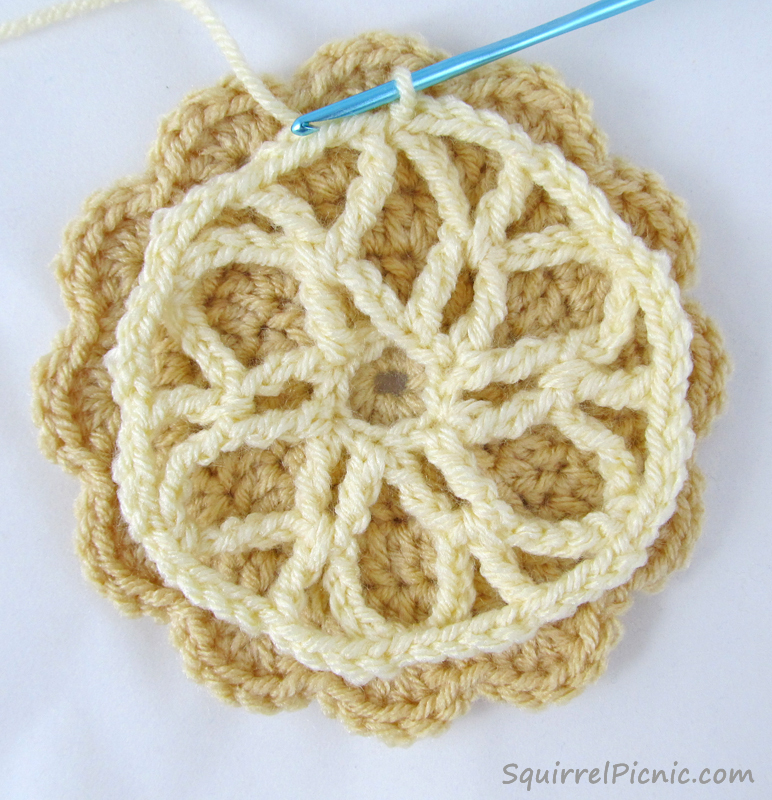 Using black tea to stain the bottom half of the cookie before crocheting layer 2 gives it a slightly darker color and really making the design stand out, as it does on the real life cookie. 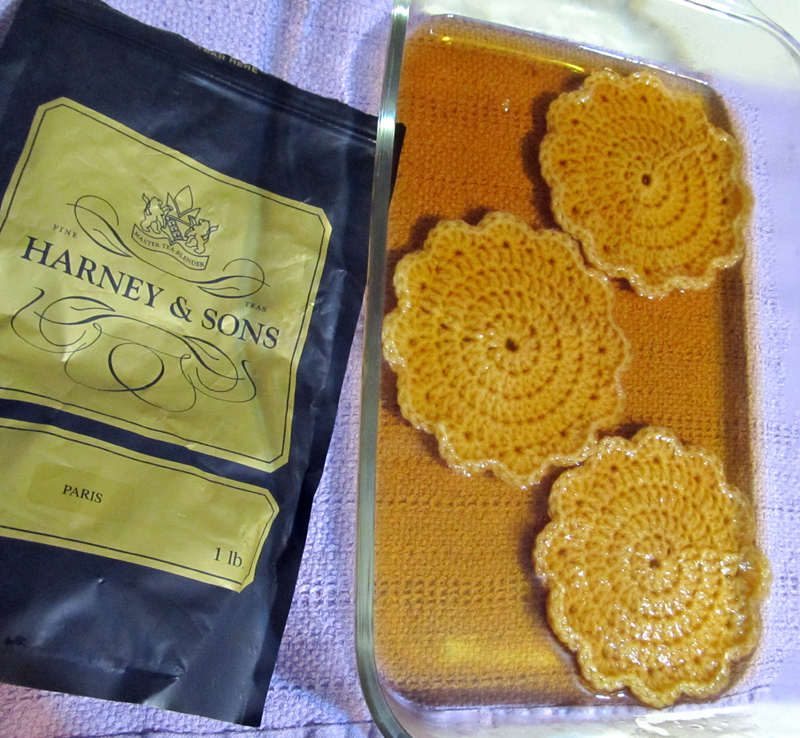 I used a tea with an aroma that I adore and the resulting pizzelle have become wonderful sachets in my home. Note: The 3-ch at the beginning of each round counts as a dc. Begin with a magic loop. Rnd 5: *Sc in next dc, sk 1 st, 5 dc into next dc, sk 1 st, rep from * 11 more times. Slst in first sc to join and BO. Work in ends. Bring 2 cups of water to boil, add tea, and let steep until the tea develops a rich amber color (about 10 minutes). I used Harney & Sons Paris black tea. 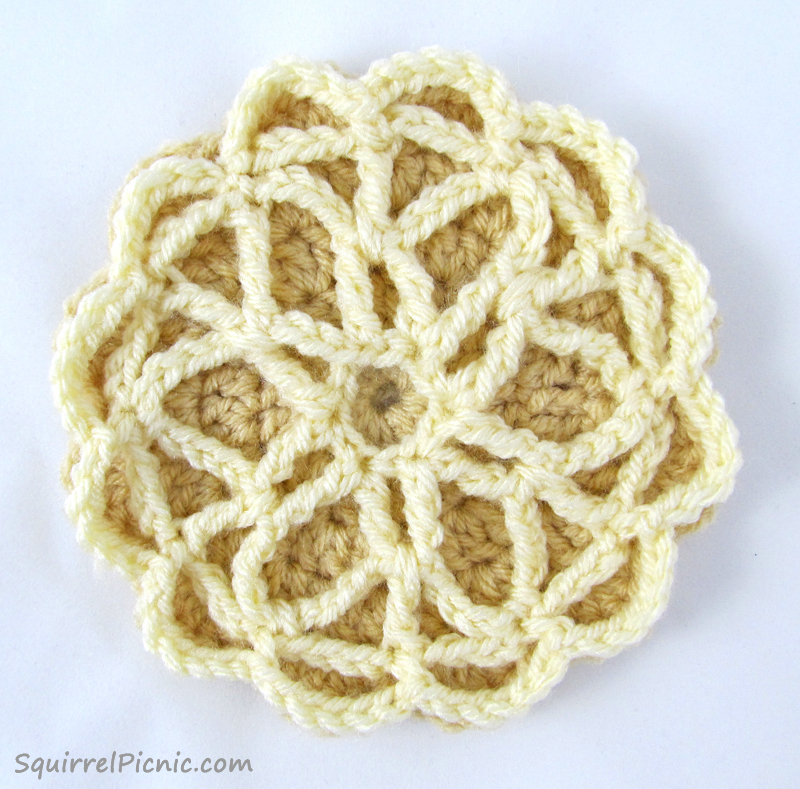 It has a fruity aroma that turned the pizzelle into a wonderfully fragrant sachet. Arrange the pizzelle in a shallow bowl and pour the tea over them. Let them sit submerged in the tea for 15 minutes or more. Dry completely before continuing with Layer 2. 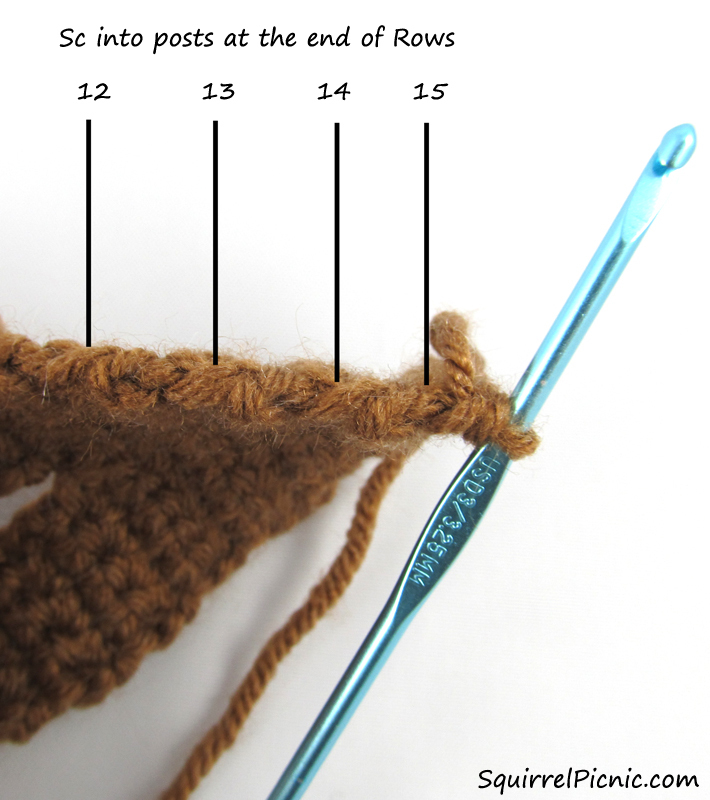 Note: This layer begins by picking up stitches on the top of Layer 1.
rep from * 4 more times. Sk, tr, ch 5, dtr into the top of 3-ch at beg of rnd. ch 4, sc into next 10-ch sp. (Instead of final sc, slst into base of 7-ch at beg of rnd). BO, and work in ends. 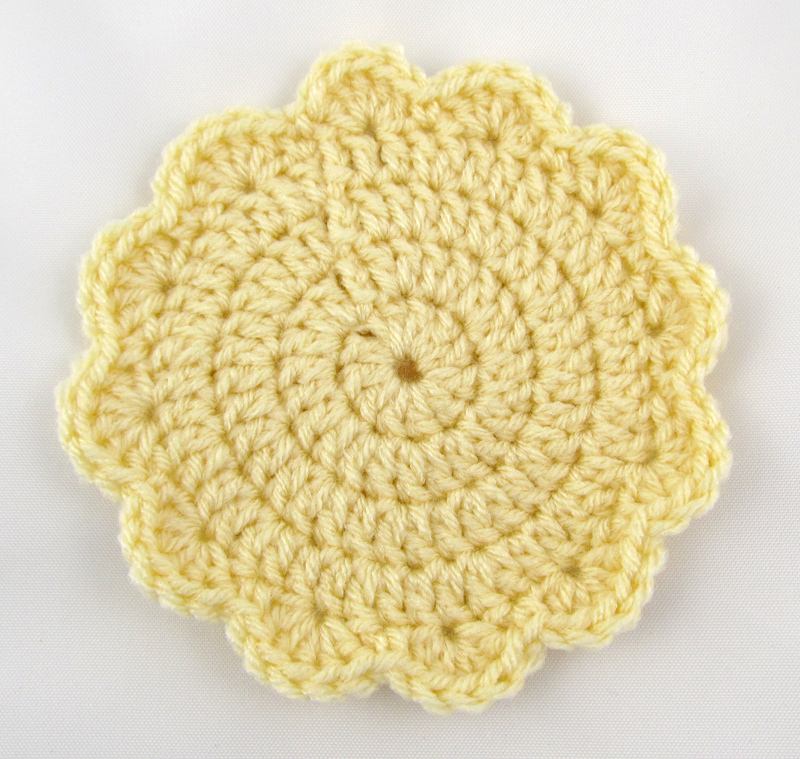 Categories: Crochet It | Tags: baking, Christmas, cookies, crafts, crochet, diy, free pattern, holidays, pizzelle, waffle cookie | Permalink. Who doesn’t love a gingerbread man? It was certainly my favorite cookie when I was growing up. My mom had cookie cutters for both a gingerbread man and a gingerbread woman. My favorite part of baking these cookies with my mom was to work the piping bag full of icing. 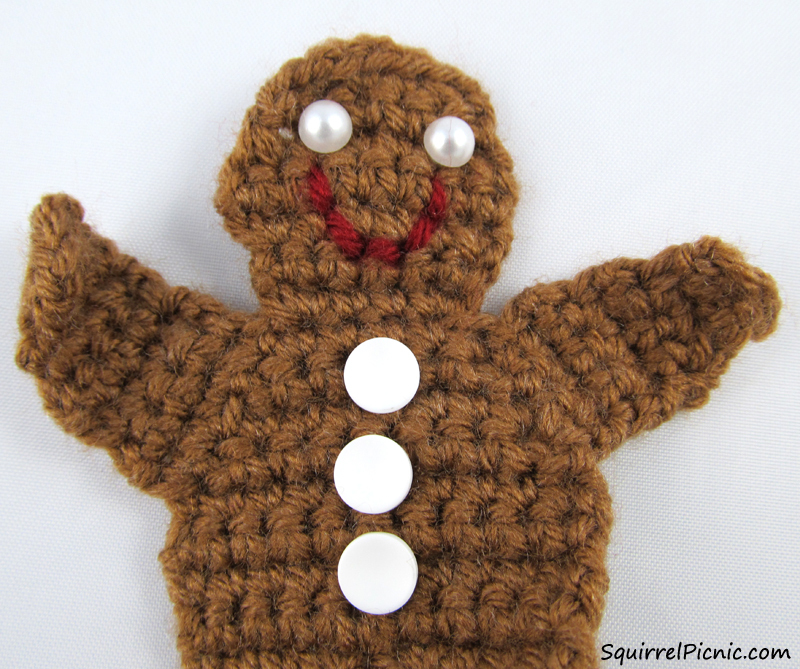 It was so much fun to give the gingerbread woman crazy ringlets of hair and to decorate the gingerbread man with buttons or sometimes a tie. Have fun decorating your gingerbread man. Use whatever you have on hand or come up with something entirely new. He doesn’t have to be a conventional cookie. Add a vest, chaps, and a handkerchief around his neck to make him a cowboy. Add an eye patch, peg leg, and striped shirt to make him a pirate. Give your gingerbread man a Speedo and six-pack abs. The skies the limit! Your gingerbread man can be anything he wants to be. 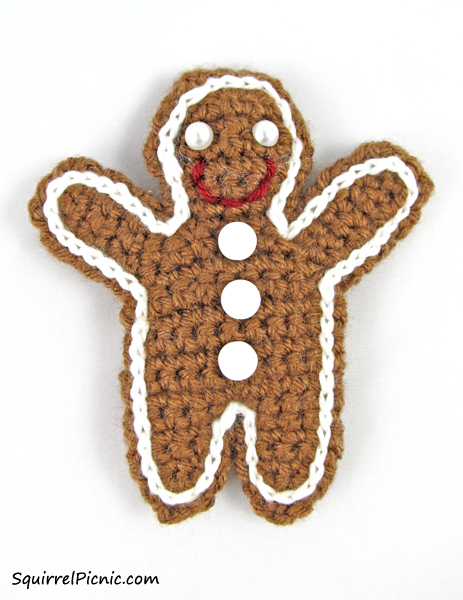 Finally, thread a ribbon through a stitch at the top of his head and your crochet gingerbread man will look right at home on your Christmas tree. He would also look quite sharp holding on to a bow on your present to someone special. Row 3: Ch 1, sc in ea sc across, turn. Rows 4-6: Rep row 3. FO. Rep rows 1-6 to make second leg, but do not FO, turn. 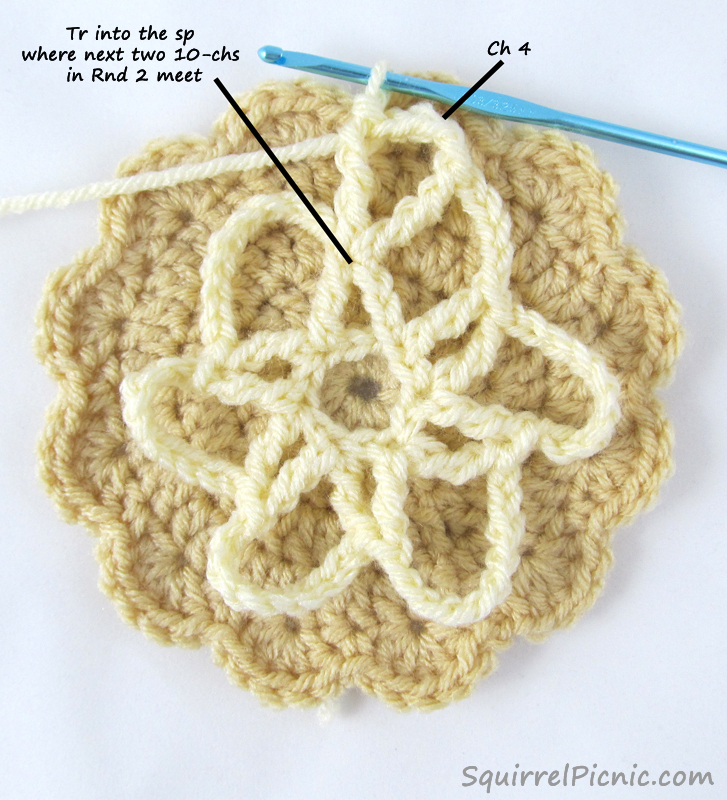 Row 8-11: Ch 1, sc in ea sc across, turn. Row 13: Ch 1, sc in ea sc across, turn. Row 15: Ch 1, sc in ea sc across. Do not FO. Row 2-6: Ch 1, sc in ea sc across, turn. Row 7: Ch 1, sc, sc2tog, sc. FO. Repeat for arm on opposite side, working in the posts at the beginning of rows 15, 14, 13, and 12. FO. Row 2: Ch 1, sc in ea sc across, turn. Sew on the eyes and buttons and embroider the mouth. Arrange the two sides with wrong sides facing, making sure that the holes at the ends and beginnings of each row line up. 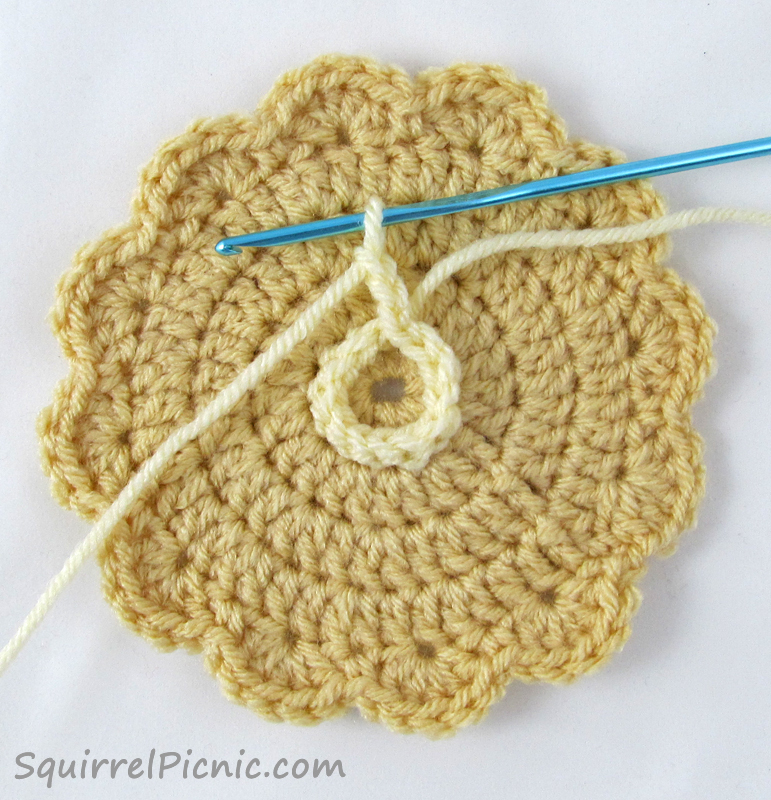 Insert your crochet hook into one of the holes along the edge (through both the front and back), pull up a loop of white yarn, and slst. Rep for the next hole and so on all the way around until you have about an inch or so left. Stuff the gingerbread man lightly. 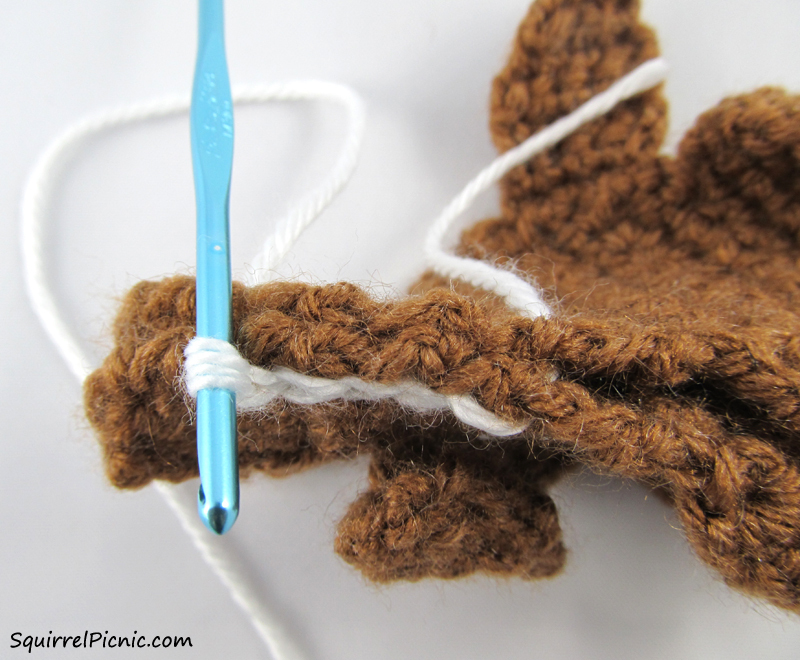 Continue to sew the rest of the gingerbread man together using the slst method. 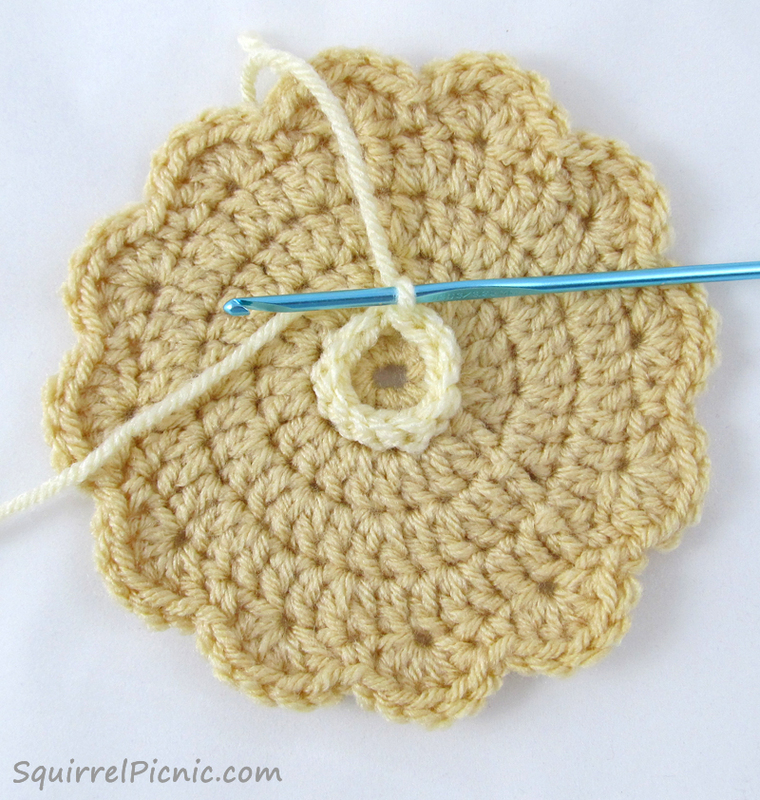 To end, insert your crochet hook up from the bottom, through the first slst and pull the last slst down to the back. FO. Attach a ribbon, hook, or ring for hanging. 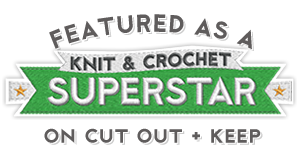 Categories: Crochet It | Tags: Christmas, cookies, crafts, crochet, decorating, diy, gingerbread man, holiday, icing, ornaments | Permalink.